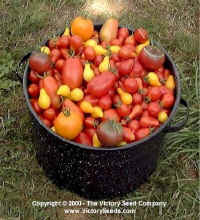 Information to help you succeed with growing tomatoes from seed. Have you ever tried Fried Green Tomatoes? It really is not difficult to grow tomatoes from seed but does take a little bit of planning. Start the seeds indoors 6 to 8 weeks prior to the last frost date in your area (refer to the Frost Pages). Plant about 1/4 inch deep, in flats or small pots using sterile seed starting material. This will help to prevent soil born disease problems. Although we try and separate seeds during the harvest process, you may find small clumps of multiple seeds in your packets. Separate these clumps into individual seeds before planting. Water lightly and keep consistently moist until germination occurs. If the seeds dry out, they will die. You can cover the pots with a plastic bag to help maintain the soil moisture but be sure to remove once plants appear. The tomato seeds germinate best if the soil is between 75 to 90°F. Click here for seed starting ideas. Full light, and cooler temperatures (60 to 70°F) will help to prevent the seedlings from becoming too leggy. After the seeds have germinated, place them in a location that receives a lot of light. A south-facing window should work. If this is not an option, a florescent lamp fixture rigged so that it is a couple of inches above the plants will work. If they do not receive adequate light, they will become spindly. After the plants have their second or third set of true leaves, and before they become root bound, transplant into 4 inch pots. This transplanting step will allow the plant to develop properly and promote root growth. Harden off plants before transplanting outside. Be careful while transplanting so that you do not disturb or damage the roots too much. Young plants are very tender and susceptible to frost damage, as well as sunburn. I protect my young plants by placing a one gallon milk jug, with the bottom removed, to form a miniature greenhouse. A couple of days of special attention like this will help to ensure a high rate of success. You should avoid giving tomato plants too much nitrogen, especially before the fruit sets. It is far better to plant them into a location that has healthy soil with high levels of organic matter worked in. Over watering may help to produce larger fruit, but flavor may be reduced. Additionally, splitting and cracking can result from uneven and excessive watering. Selection tips -- Determinate types ripen over 3 to 4 weeks and their bushes generally do not need staking. Indeterminate continue to grow even after the fruit sets and ripen continuously until a frost arrives. Tomato Disease Tolerances -- "F" indicates a resistance to Fusarium wilt, "V" a resistance to Verticillium wilt, "N" to nematodes (root knot), "T" to the tobacco mosaic virus, and "St" to Stemphylium (gray leaf spot). Note: Tobacco users should not come in contact with seedlings to help prevent infection with the tobacco virus. For links to information about tomato diseases, click here. Step by step tomato seed saving pictorial. Although indeterminate heirloom tomato varieties typically ripen throughout the growing season, there are times when you may end up with an abundance of fruit and little time to cook into sauces or can. One solution is to freeze some for use during the winter months. Simply cut about 3/8 of an inch off the stem end of each fully ripe, unblemished tomato. Package them for the freezer by placing them into a freezer bag and placing the freezer bag in a brown grocery bag for extra protection. When ready to use, hold the frozen tomatoes under hot water for a few seconds. The skin will split open and slip off easily allowing you to use them in you usual recipes. Many recipes call for peeled, whole tomatoes. A very simple way of peeling tomatoes is to blanch them. Simply plunge them into a hot water bath just long enough for the skin to separate. The whole tomato will easily pop out of their skins. Do not leave in the hot water any longer than possible as they will begin to cook and soften. The tallest tomato plant was 65 feet, grown hydroponically by Nutriculture Ltd., Mawdesley, Lancashire, England, on May 11, 2000. The world's largest tomato fruit was grown by Gordon Graham of Edmund, Oklahoma and weighed 7 pounds, 12 ounces. Please remember that maturity date are from time of setting plants into the garden. Additionally these dates will vary from location to location and even from year to year. They are for rough planning purposes only.